Missouri Secretary of State Jason Kander (D) says President-elect Donald Trump is filling his cabinet with Wall Street executives and possible Russian intelligence agents. He tells MSNBC that Trump’s choices don’t make the swamp less swampy. 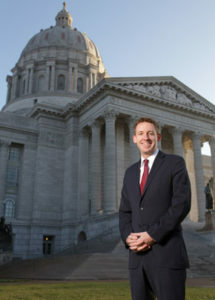 “When Donald Trump makes a bold claim like he’s going to drain the swamp, and then he starts to do things that look like the opposite of it, well that has a really profound effect on people actually staying in the process and not checking out of it,” says Kander. During the campaign trail, Trump vowed to “drain the swamp” by getting rid of corruption and greed in government. “It would be real handy if we could do some full investigations to find out, for instance, what their ties are in the corporate world or what their foreign ties are. I mean, that’s traditionally what’s done,” says Kander. Several of Trump’s cabinet nominees require U.S. Senate confirmation. Secretary of Treasury: Steve Mnuchin, co-chair and CEO of Dune Capital Management. He worked at Goldman Sachs for 17 years.